The Homepage is the first page you see after log-in. It holds all elements that have been made available to you by your Administrator and that are pertinent to the performance of your organization. The Homepage is arranged in two blocks, the Left Sidebar and the Main Panel. The Homepage only contains those elements and Dimension Values that you have Permission to access. There are also four different Main Panel options, as well as filter options that allow you to restrict the contents of the Main Panel as explained below. Show All: reveals all the content which a user has permission to access and which has been made visible on the Homepage. Most Popular Folder: This folder allows you to see what elements other Users are finding useful. This system-generated Folder is populated with the tiles representing those elements which either have been recently added to the favorite folders of others or were viewed by others within the last specified number of days. This calculation excludes the current User. This Folder name should never be changed. The default number of tiles shown in this folder is 5, but you can increase it at Admin > Utilities > Config Variables > MOST_POPULAR_FOLDER_TILE_COUNT. The amount of days to consider while scoring the "Most Popular" folder can be defined at Admin > Utilities > Config Variables > MOST_POPULAR_FOLDER_VIEW_DAYS. 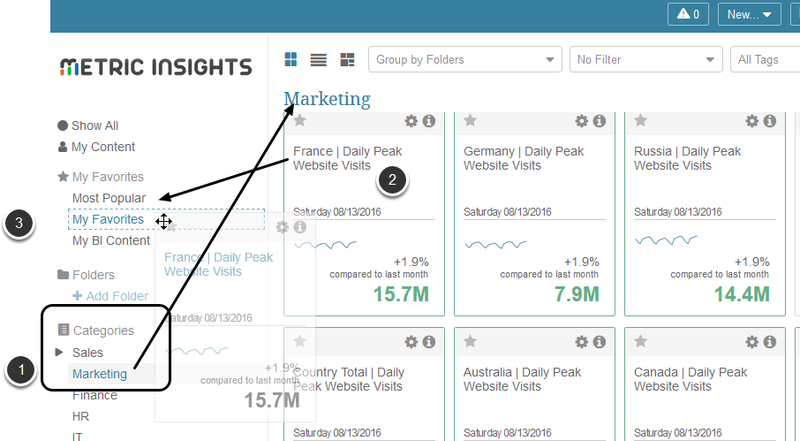 MAIN PANEL includes all Metrics, Multi-Metrics, Reports and External Reports that are made visible on the Homepage and to which you have access. There are 3 distinct views to choose for the Main Panel display but one is only for Favorites folders. 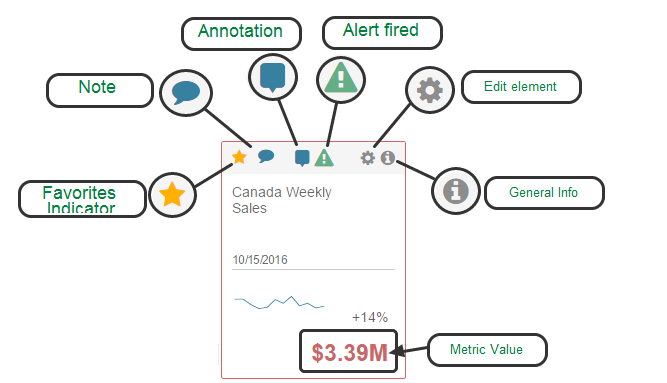 A tabular view of your elements that allows you to quickly scroll through current values, Alerts, and changes. Similar to the Tile View, but the Filters and Search options are removed. In image above, we are copying a tile from the Marketing Category to My Favorite Folder. We do this by selecting the Category to display it's Tiles on the Main Panel. Then drag the tile into the Favorite folder. The Folder you are dragging into will be indicated by a dotted square. You are only able to copy from a Category to a Folder or Favorite. You cannot move or copy tiles between Categories; Category is set in the element's Editor. Highest Level filter is Search by name or element description. 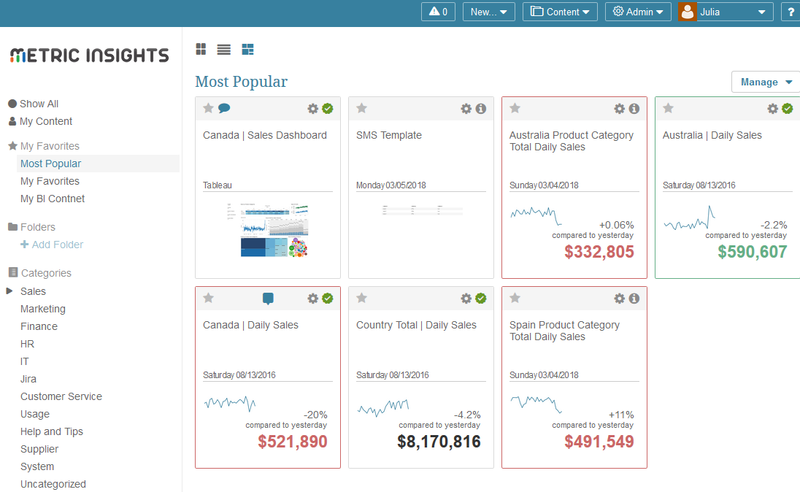 Limit your display or search by Topic (Sales, Orders). Limit display or search using Filter (by specific items/dimensions/element type). You can Group the display of Homepage elements (Homepage, Stoplight value, Measurement Interval) - example is by 'Homepage'. Grouping options: Homepage content can be group by different criteria: by Folders (represented by the Favorites and Categories from the Lift Sidebar), by Update Frequency, by Measurement Interval, etc. 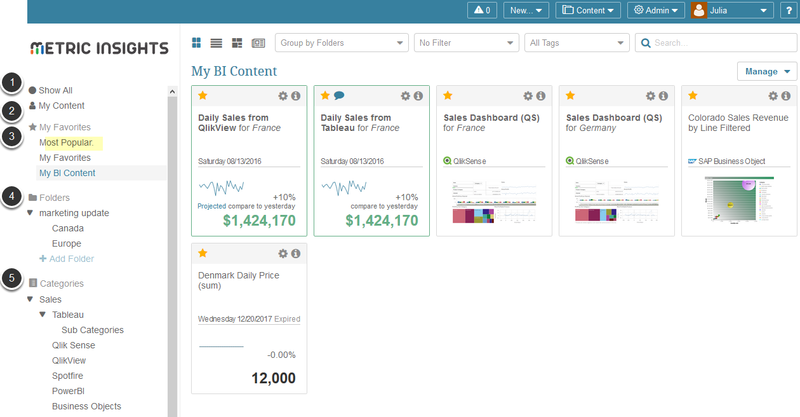 Filtering options: by Content Type (Metric, Report, External Report), Report Type, Stoplight (Performing, Underperforming), Area, etc. Search: by keywords in name or description. A Metric is a measure that contains a single value for any point in time and that is measured over time. An example of a Metric is "Daily Sales"
A Multi-Metric is a chart containing several trend lines and combining more than one measure to allow you to compare each Metric’s individual trend line. The person whom defines the Multi-Metric chooses at least two previously defined Metrics to be charted by the system on the same graph in order to better understand how the various Metric trends related to each other. 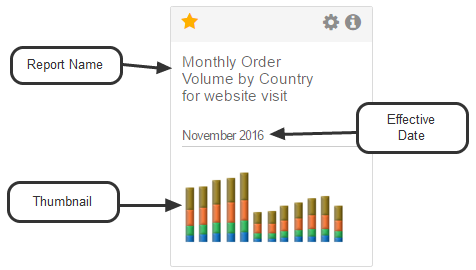 A Report typically includes tabular data and one or more charts based on data selected by the person creating the element. The Effective Date of the Report is not the same as the date on which the report is run. This date represents the report's "As of" date. If the Element is defined as Dimensioned, there is a tile for each Dimension Value. 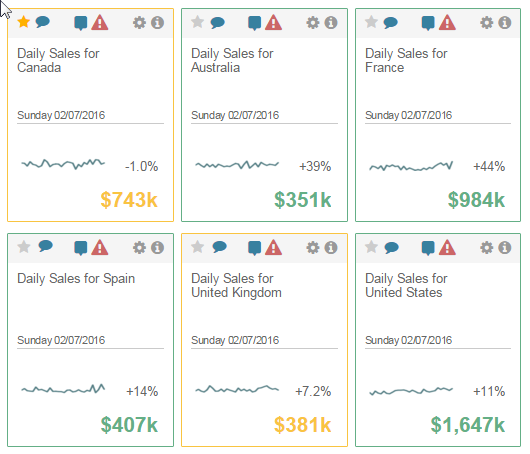 In this example, Daily Sales is dimensioned by Country. NOTE: As noted above, you only see tiles for the Dimension Values for which you have Permission to access. 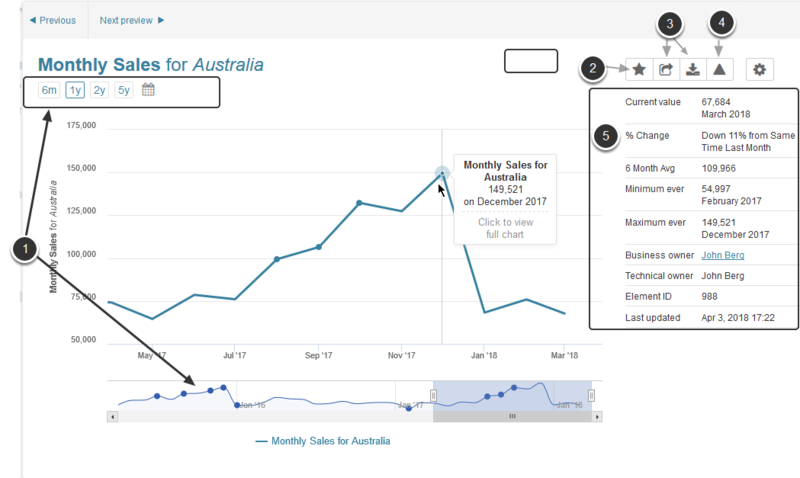 Single-clicking on any tile opens a Preview pop-up or, if previewing is not enabled, a Full Chart view. 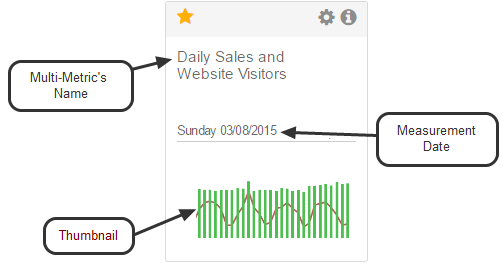 Double-clicking on the tile or single-clicking on the Preview always opens the larger chart view (Live view). Next: How do I set my Home Page to always open to Same Section?